A multi functional wine rack perfect for the dining room. Wine racks are practical and useful but there are cases when they just take too much space. When you keep the wine rack in the kitchen for example, it can get really annoying to have that space occupied by something that just stands there. So why not get it out of there and put it in the living room or dining room for example? We have the perfect item for that. 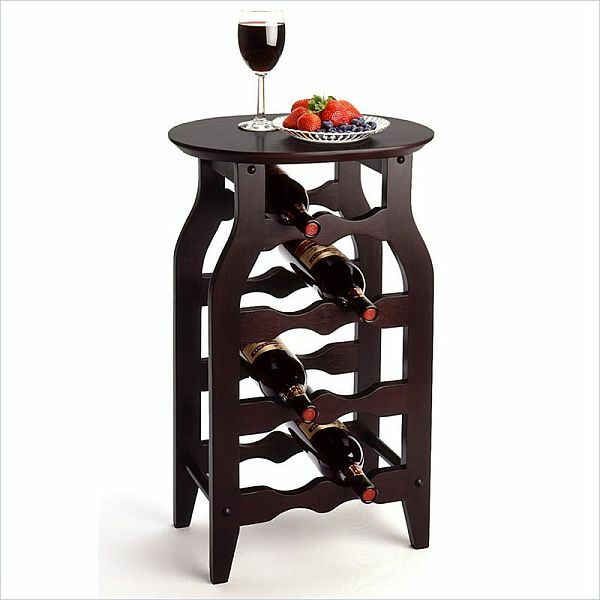 The Winsome wine rack is double functional because the bottom serves as a storage unit for wine bottle while the top can be used as a side table. You can use it to display something beautiful like a vase filled with flowers or any other decoration or you can simply leave it like that and rest your glass on it. The Winsome wine rack is capable of holding 8 bottles. It’s a great combination of function and style. The item features a solid hardwood construction, with a flare-turned leg and rack assembly beneath and a lovely oval top that completes everything. The wine rack has a beautiful espresso finish. The overall dimensions of this product are 25″ H x 16″ W x 12.5″ D and you can buy for only $38.99. It’s a great alternative for the standard wine racks just are also beautiful but less functional.